Finally I got a daytime video clip of this phoebe family. So why is the video so dark? 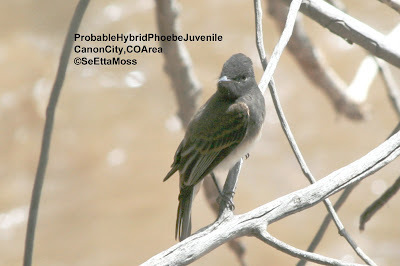 These phoebes like to perch below overhanging vegetation in the shade and this is just such a shady/dark location. And they are on the other side of the Arkansas River which at this point is 80-100 feet away so I have the zoom all the way out to 40X. Even at that there are several times when the orange lining of the fledglings mouth is quite visible. The young are now 10 days old and 2 on now independent leaving this last one (from the last egg laid) to be fed by the attending parent. Though they have again moved from the location adjacent to the nest site, they are only about 150 feet downstream still along the Arkansas River. 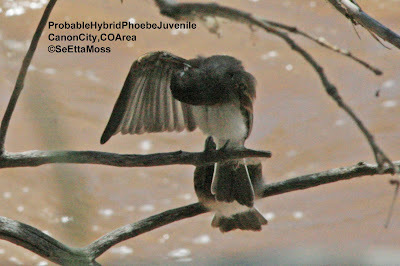 Though I wasn't able to get any video or photos of the phoebe fledglings on the morning after they had fledged, I did get these less than desired photos of the parent birds as they would fly near enough for a pic when getting food for their young. 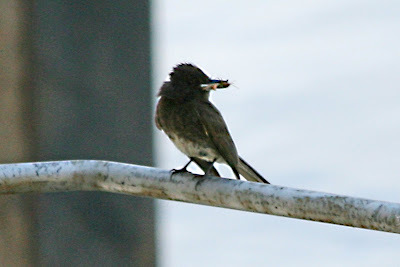 The top pic shows an apparent Black Phoebe (however, with so many phoebes of intermediate plumage in this area there is always some uncertainty) with some food in it's bill for the fledglings.